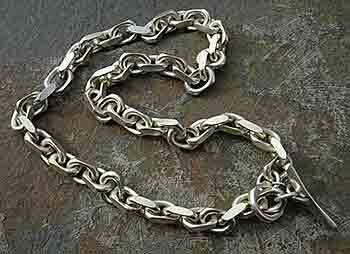 MEN'S STERLING SILVER CHAINS : LOVE2HAVE in the UK! The Best! British made men's sterling silver chains all handmade in the UK at prices you can afford. Fully guaranteed and returns accepted. Sometimes we wonder how the major high street stores manage to convince the public that they are getting a fantastic choice in their men's silver chains. On closer inspection, what you will find, are very standard silver chains that come off mass produced lengths of silver roll imported from abroad. They are nothing special and lack all individuality. Some even are hollow, which accounts for the lightweight and super low prices they retail for - something not of high quality whatsoever. All our men's silver chains are made of solid sterling silver and have an incredible unique urban quality to them. They have been chosen to suit men with an eye on designer styling, value for money and high quality. Not only can we accommodate all these values but all the silver chains can be made up in any length too (see our matching men's silver chain bracelets); so if your desired size is not indicated, please do contact us first and we will be more than happy to assist.